Menopause symptoms are caused by changing hormone levels, mainly estrogen, which drops significantly during menopause. Estrogen plays many roles in a woman's body, and one of estrogen's tasks is regulating mood. Dropping estrogen levels can trigger a wide spectrum of mood swings and changes. However, the relationship between hormonal changes during menopause and psychological conditions such as anxiety disorders and depression are unclear. Depression and anxiety affects 19 million Americans each year, and up to one in five American women will suffer from clinical depression at some point in her life. 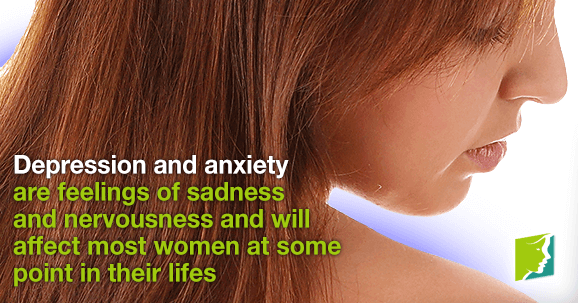 Women are two to three times more likely than men to suffer from depression. Menopausal women are not more likely to experience clinical depression or an anxiety disorder. However, this does not mean that menopausal women do not experience these conditions, or that when they do experience these conditions they are completely unconnected to menopause. It is important to remember that there is a difference between feeling occasionally depressed and anxious, which is normal and can be triggered by menopause, and having clinical depression or an anxiety disorder, which are potentially serious medical conditions that should receive medical attention. It is important to see a doctor if you think you have either clinical depression or an anxiety disorder. If a woman has a history of depression or anxiety, she is more likely to experience these conditions when her hormone levels decrease around menopause. One of the most common symptoms of menopause is night sweats. Women who experience chronic night sweats during menopause are at a much higher risk for developing fatigue, depression, and anxiety. It is important to see a doctor who will be best prepared to help you and will provide prescription medicine to help if you have an anxiety disorder or clinical depression. Many women use estrogen replacement to treat the emotional symptoms of menopause. Antidepressants and anti-anxiety medicine are also available by prescription to treat depression and anxiety respectively. Seeing a therapist or counselor regularly can help a person with anxiety or depression work through their problems and teach them ways to handle their condition so it does not control their day-to-day life. An important first step in treating depression and anxiety is seeing your doctor, who can prescribe you medicine, help you better understand your condition, and recommend you to a specialist, such as a psychologist, who can help you work through your condition. Several different medications are available for depression, and the most appropriate one varies by individual case.